Founded in 1964, SP Guide Publications had been into niche publishing with their mega brand SP's Military Yearbook. 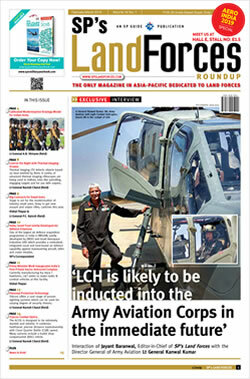 With launch & success of SP's Aviation, in Feb 2004 SP's Land Forces was launched realizing the need of a dedicated journal to address the issues pertaining to Armed Forces. Mr George Fernandes, the then Defence Minister did the honor by releasing the first issue. The bi-monthly got popular soon with its extensive updates, incisive analysis diverse perspectives on various issues, interviews & expert views. Today, SP's Land Forces receives accolades from ministry, senior officials, serving officers, PSUs & industry globally. With its unique, out-of-line size, SP's Land Forces has carved a niche for itself and thus adding one more laurel to SP's crown.